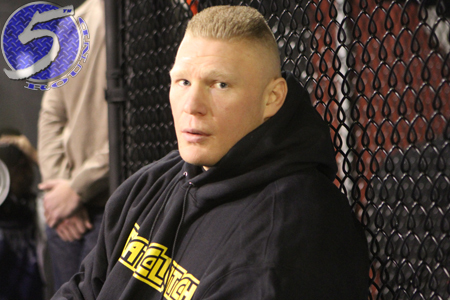 Following UFC 146, company president Dana White revealed former heavyweight champ Brock Lesnar (Pictured) requested to have a one-on-one chat with him and that the current WWE superstar was “probably” returning to the world of mixed martial arts. Fast forward just two weeks and it appears the chances of Lesnar coming back to the Octagon range between slim to none. “The meeting that we had didn’t really go very well,” White stated on Friday’s FUEL TV post-fight show. “It wasn’t a great meeting. It was probably one of the worst meetings we’ve ever had with Brock Lesnar. I honestly have not talked to him since, so I don’t know where we are at. So, all the stuff you are seeing on the Internet is typical Internet [expletive]. Well, that should “probably” be the end of that. Lesnar retired from MMA after getting steamrolled by Alistair Overeem at UFC 141 this past New Year’s weekend. However, the 34-year-old was mysteriously sitting Octagon-side to watch Junior dos Santos maul Frank Mir on Memorial Day weekend. “The Next Big Thing” made his return to the WWE this past April. He reportedly signed a one-year contract. Lesnar hung up his MMA gloves with a 5-3 professional record, with all but one of his scraps coming inside the Octagon. Four of his seven UFC fights were of the championship variety.